Raising ‘self-awareness’ by identifying individual strengths and weaknesses, skills, material and spiritual values, interests and passions. Examining the impact of destructive emotions and developing positive perspectives, attitudes and responses to our emotional life. 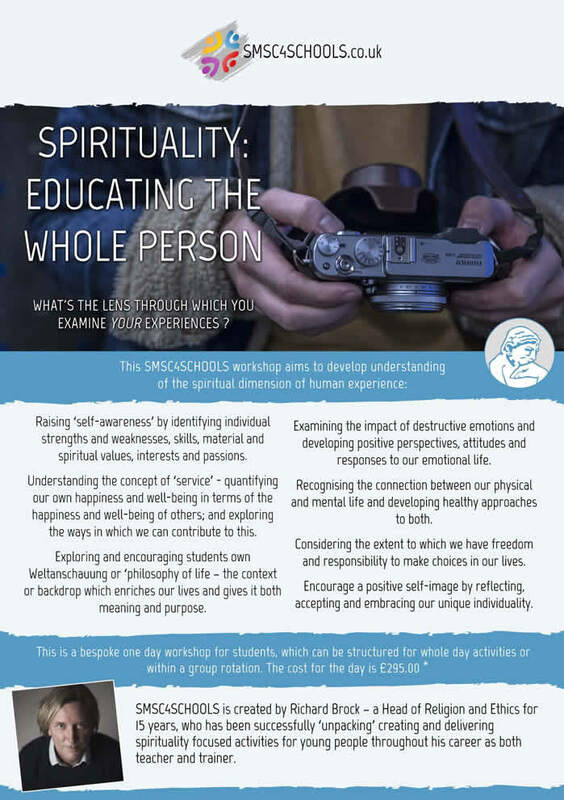 Exploring and encouraging students own Weltanschauung or ‘philosophy of life’ – the context or backdrop which enriches our lives and gives it both meaning and purpose. Understanding the concept of ‘service’ – quantifying our own happiness and well-being in terms of the happiness and well-being of others; and exploring the ways in which we can contribute to this. Recognising the connection between our physical and mental life and developing healthy approaches to both. Considering the extent to which we have freedom and responsibility to make choices in our lives. Encouraging a positive self-image by reflecting, accepting and embracing our unique individuality. 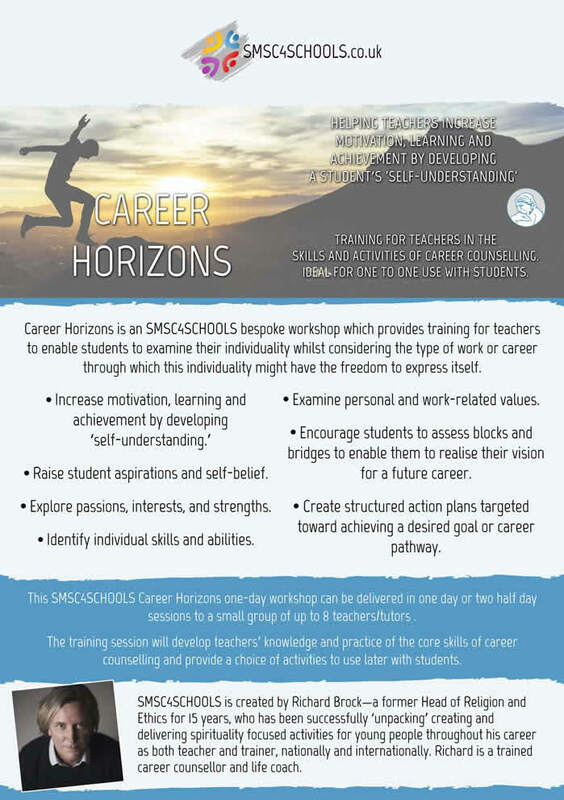 This is a bespoke one day workshop for students, which can be structured for whole day activities or within a group rotation. The cost for the day is £295.00. 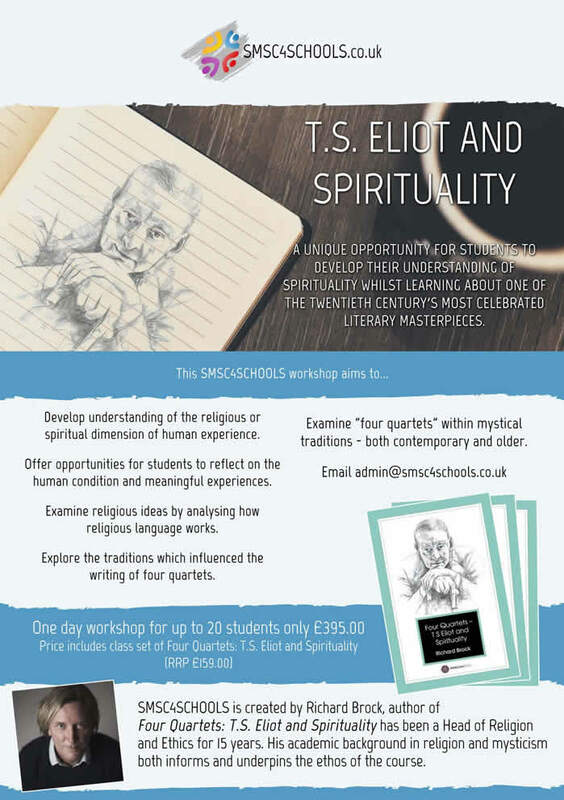 A unique opportunity for students to develop their understanding of spirituality whilst learning about one of the twentieth century's most celebrated literary masterpieces. Develop understanding of the religious or spiritual dimension of human experience. Offer opportunities for students to reflect on the human condition and meaningful experiences. Examine religious ideas by analysing how religious language works. Explore the traditions which influenced the writing of Four Quartets. Examine Four Quartets within mystical traditions both contemporary and older. This one day workshop for up to 20 students costs £395.00 and includes a free class set of presenter Richard Brock's recently published book, Four Quartets: T.S. 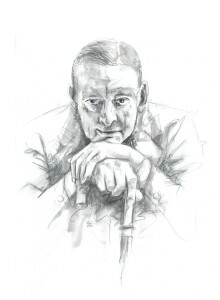 Eliot and Spirituality (RRP £159.00). T.S. Eliot: Four Quartets and Spirituality. This download includes a scheme of work comprising 20 hours of lessons and resources. 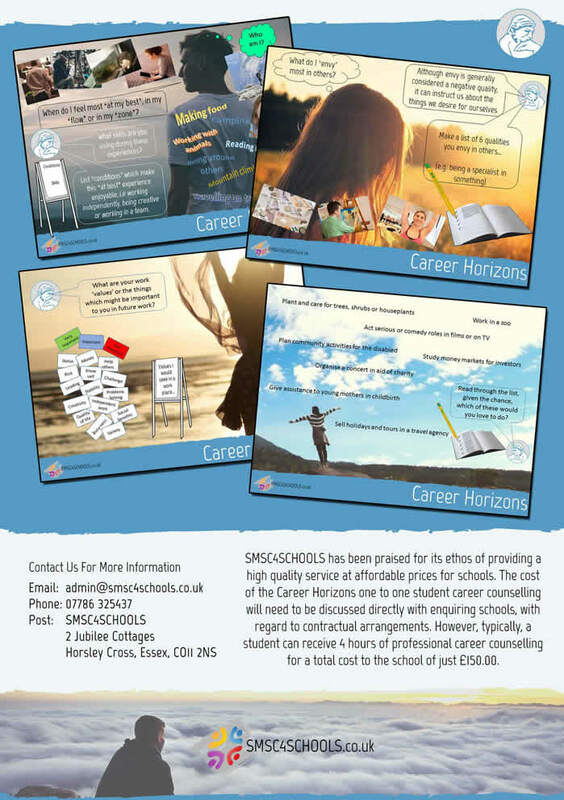 Ideal for Gifted and Talented, KS4 and KS5. Suitable for Religious Studies, English Literature or simply an off-topic unit of study. 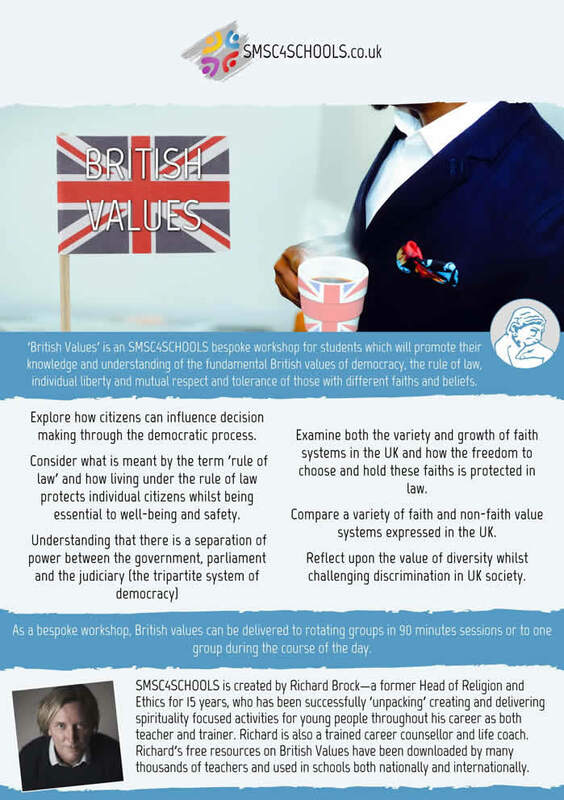 ‘British Values’ is an SMSC4SCHOOLS bespoke workshop for students which will promote their knowledge and understanding of the fundamental British values of democracy, the rule of law, individual liberty and mutual respect and tolerance of those with different faiths and beliefs. Explore how citizens can influence decision making through the democratic process. Consider what is meant by the term ’rule of law’ and how living under the rule of law protects individual citizens whilst being essential to well-being and safety. Understanding that there is a separation of power between the government, parliament and the judiciary (the tripartite system of democracy). Examine both the variety and growth of faith systems in the UK and how the freedom to choose and hold these faiths is protected in law. Compare a variety of faith and non-faith value systems expressed in the UK. Reflect upon the value of diversity whilst challenging discrimination in UK society.